Peppercan, our new web-based business application from SafeComs, has just been selected as a WINNER in application and infrastructure category of a prestigious ICT Award 2009. 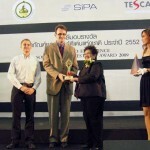 SafeComs Thailand, a Bangkok-based company specialising in comprehensive network security for computer systems, has been honoured with the runner-up award in the best SME category by the Australia-Thailand Chamber of Commerce. Every year, the NTCC and Beluthai host their “Awards Ceremony for Business Excellence”. This year’s ceremony held on the 11th October in the ballroom of the Conrad hotel in the presence of a very prestigious guest Khun Abhisit Vejjejiva, honored several outstanding corporations that have exhibited true excellence and innovation in their field, while at the same time maintaining high standards in corporate citizenship.